Speed gains of up to 2X overall and 6X for curves. Interactive continuous rendering while modelling, animating, texturing, shading and more. New curve rendering techniques designed around ray tracing large amounts of curves while editing grooms and looks without needing to re-render to see changes. Changes to the light selection techniques improve convergence on scenes with many lights and many types of lights at the same time. Bridge products get streamlined workflows to enhance this releases interactive rendering capabilities. Improved exposure of RenderMan Attributes and Options help users make decisions and see results at all stages of production. RenderMan for Maya and Katana have been redesigned. It’s also now possible to Render directly to Viewport 2.0 in Maya and see changes as they happen. 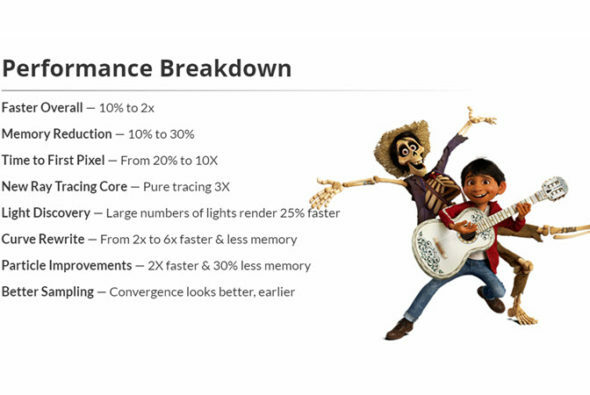 To complement the interactive always-on workflow, ray tracing core has been rewritten to improve speed and quality. Renderman now supports partial presence values (values between 0 and 1) for true opacity. This changes how presence on camera rays are calculated and results in noise-free partially opaque effects up to a user-specified depth in the integrator. OpenVDB has been updated so that PxrVolume provides more sampling options to enhance performance as well as new support for OpenVDB 4.0. Improved Sampling Stratification improves noise reduction, time to converge, and preview renders. A new Adaptive Sampler Option that may provide better convergence at higher Variance thresholds. Узнать больше можно на Renderman website.